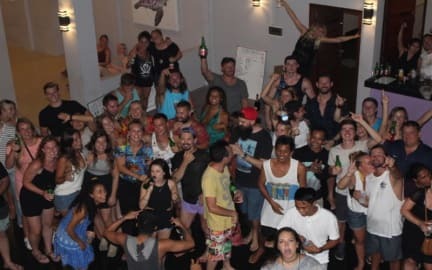 As the largest hostel on the island, My Mate's Place boasts a huge, buzzing social area where by day you can chill on one of our cozy beanbags before hitting up our bar by night to socialise with the other guests. Once our hostel bar is closed we'll be sure to take you out to the best party spots Gili has to offer each night. Our rooms feature large, individual lockers, with key provided, for you to safely store all of your belongings. Each bed has it's own reading light, small storage shelf and an international charging point for your electronics. We also provide a free towel for the showers so you can save yours for the beach! Each morning there's free tea, coffee, water and a basic breakfast so that you're refuelled for the day ahead. Of course we also have free, hostel-wide WiFi for guests. Our friendly and knowledgeable staff are always on hand and ready to help so whether you want to know the best spots to eat or wanna get the party started with some drinking games just give us a shout! 1. Check in time will be 2pm, unless your beds are available sooner and confirmed by hostel management. - Don't worry we have secure bag storage and all our hostel amities are available while you wait for you check in. - Upon Check in, we hold onto your passport as a security deposit and to ensure its safe keeping while on the island. 2. Check out time is 10am. 3. Payment: The full balance needs to be paid in CASH upon arrival. (2) If canceled or modified later, first night will be charged. (3) for No Show, the full balance will be charged and no refund will be given. 5. Age Restriction: The minimum age to stay at the hostel is 17 years old.